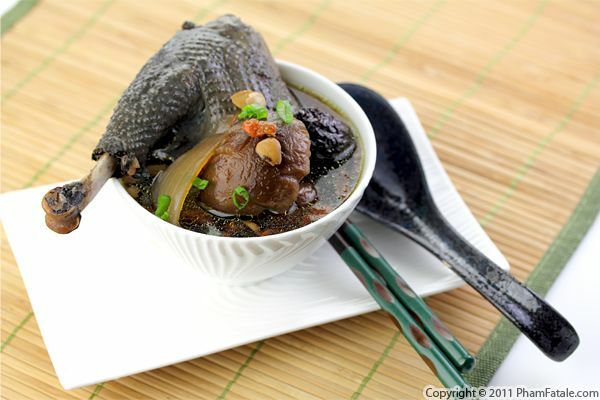 Canh gà hầm thuốc bắc, or "stewed black chicken soup" in Vietnamese, is known for its medicinal properties. It's the cultural equivalent of chicken noodle soup when you feel sick. In addition to its purported healing properties, it has a reputation of enhancing lactation for breast-feeding mothers. I don't know if it really helped nourish my baby girl but the broth is very tasty. "Gà ác", which literally translates to "cruel chicken" is black chicken. It's parboiled then cooked overnight in a slow cooker. The soup requires several ingredients called thuốc bắc (traditional Chinese medicinal herbs and roots). It's composed of several kinds of dried mushrooms, gojee berries, ginseng, almonds, dried dates, dried jujube, dried lily bulbs, dried longans and fresh ginger. The addition of dried fruits makes a delicious broth with a complex flavor and natural sweetness. The first time I tasted lingonberries was during a trip to England. As a child, I traveled a lot to Great Britain and stayed with host families so I could improve my English. There would usually be another international student staying with the host family. One time, I stayed with a Swedish girl. It's been so long I can't remember what her name was, but I do remember that she introduced me to many new flavors. Typically, the students would bring a present that represented his or her culture and country. I would usually bring either chocolates, wine or Champagne. But this Swedish girl brought lingonberry preserves that were delicious. Lingonberries are Scandinavian berries with a flavor reminiscent of cranberries but slightly less tart and sweeter. And like cranberries, I think the preserves go especially well with white meat. If you're preparing your Christmas menu, this lingonberry roasted chicken could be a festive and tasty option for your main course. I roasted a whole chicken, adding the preserves to the marinade and glazed the chicken at the end so the skin turned sweet and crispy. There's a giant IKEA store near where we live. I sometimes wander in the food area and buy Swedish root beer, delicious sparkling pear drink, Swedish meatballs and of course lingonberry preserves. If you don’t have an IKEA nearby, you can always buy lingonberry preserves online. 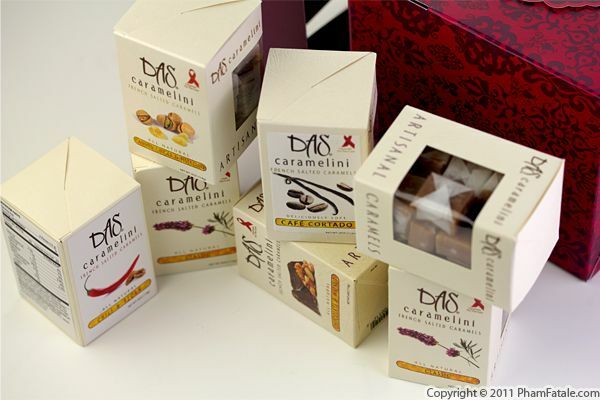 Today's giveaway is the Caramelini Gift Box of salted caramels from Das Foods. The flavors are unique: Chili Pecan, Orange Honey and Ginger Pistachio (my personal favorite), just to name a few. I grew up with far more traditional fleur de sel caramels from France, so it was very nice to see such a creative take on a classic treat from my childhood. As an added bonus, the packaging is so lovely that they also make a wonderful gift. For your chance to win these caramels, just enter on the 25 Days of Giveaways page. Make sure you're a fan of PhamFatale Facebook fan page and Das Foods, or follow @Phamfatalecom and tweet about this giveaway. To make it easy, you can just copy and paste this tweet if you’d like: "the Caramelini Gift Box (salted caramels) #Giveaway from @Phamfatalecom: http://bit.ly/sp4V7y". I love incorporating fruits in savory dishes. Soups are a great way to do it, and today I made a soup similar to Vietnamese pumpkin soup (canh bí), but substituted ripe papaya for the pumpkin. It's called "canh đu đủ" in Vietnamese. I made the soup using chicken stock; you could use fish stock, vegetable broth or any other of your favorite flavorings. 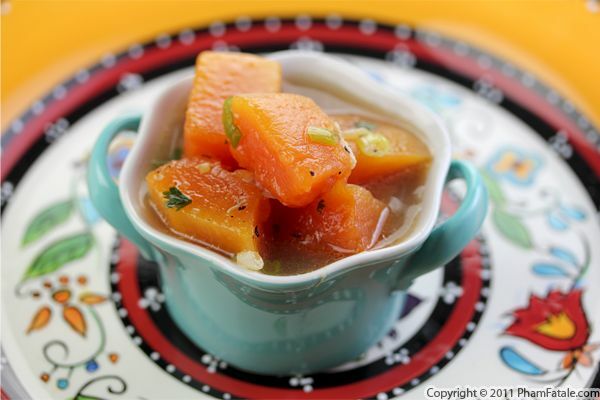 The natural sweetness from the papaya balances the flavors of a soup broth very well. At first sight, the beautiful orange color is reminiscent of fall colors due to the presence of carotenes in papaya. The flavor is quite different though. If you're looking for a healthy, flavorful soup, this is it. In addition to tasting delicious, in Asian culture, old wives' tales say that papaya soup increases lactation for breastfeeding women. 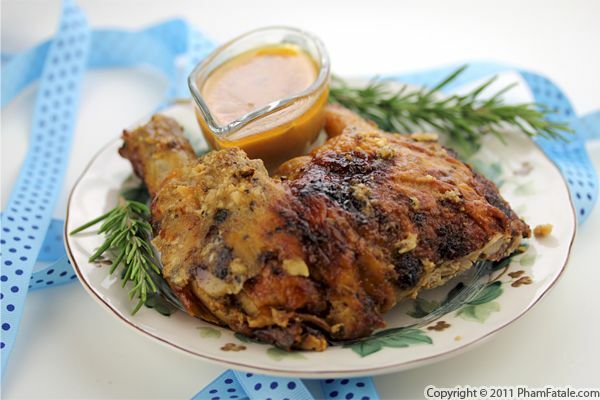 True or not, if you've just given birth, this recipe could help. It's already the end of the fig season in our garden. We lucked out this year and gathered so many baskets of delicious figs. One of the best ways to extend the life of quality fruits is to preserve them, so with the last batch, I decided to make fig chutney. The chutney is very versatile, and I’ve used it in quite a few dishes. Today I paired it with stuffed chicken rolls. I marinated chicken breasts with Bourbon Barrel Kentuckyaki sauce and stuffed them with goat cheese. 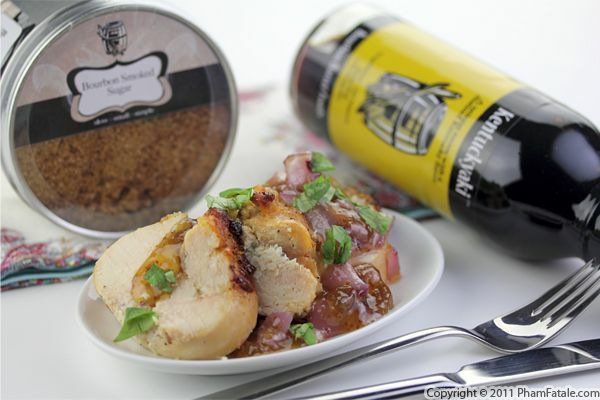 All you need is to bake the stuffed chicken for about 30 minutes, then cut it into rolls. I served the white meat with fig chutney that I flavored with Kentuckyaki sauce as well. 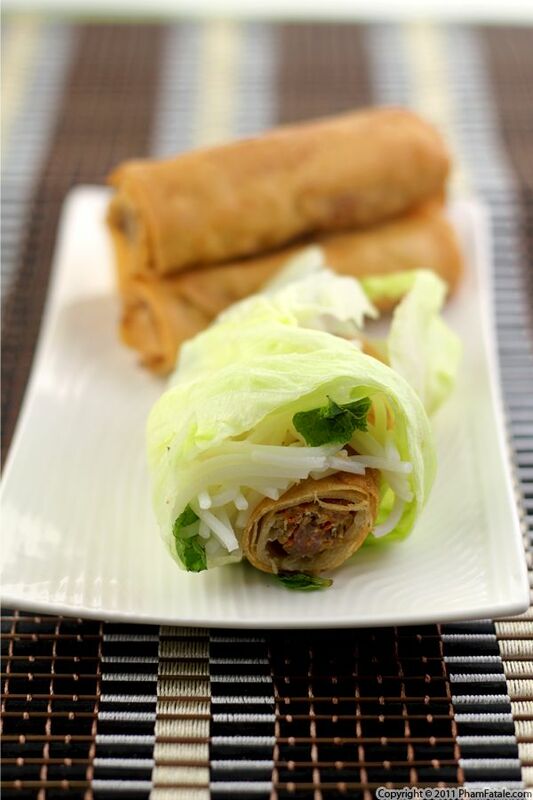 Here's to a flavorful meal!